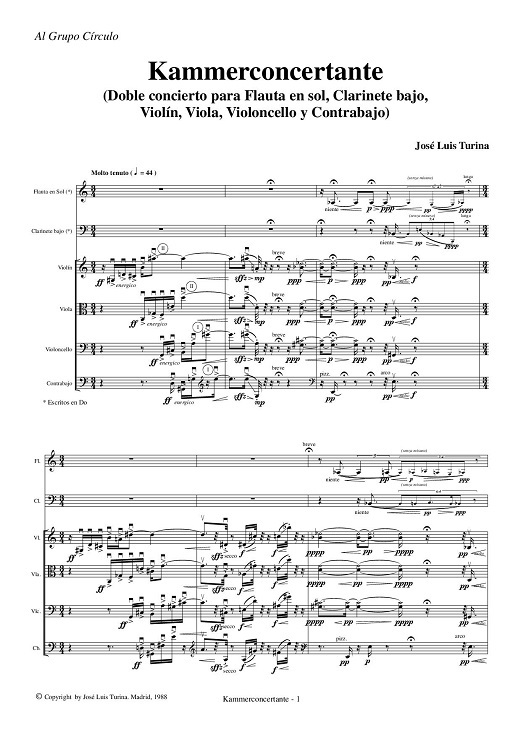 Indeed, it is a reduced double-concerto (in relation both to its length and to the little thickness of its instrumentation), in which two woodwind soloists (an Alto Flute and a Bass Clarinet) develop a kind of highly vistuosistic concertante treatment, with the support of a small chamber ensemble (a string quartet made up with a iolin, a viola, a cello and a double-bass), whose treatment oscillates from the ripieno to a virtuosism which dialogues at the same level than the soloists. The piece is ordered in six sections, the last three of which are a "gloss" of the former three. Thus, in the first and fourth sections (Molto tenuto), soloists and strings develop very differentiated treatments which tend to be equal in the second and fifth sections (Piú mosso) anf fuse altogether in the third and sixth ones (Allegro), where there is not any distinction between the writing of (for instance) flute and double-bass. Short cadences of the soloists separate (or connect) some of the sections. The writing, in general, is developped in an "atomized" way in small cells, which are distributed throughout the ensemble (in italian style) and related between them in a german type of speech. Hence the german-italian game of words which serves as a title for the piece. Kammerconcertante was written in june, 1988, as a commission of the spanish Centre por the Difussion of Contemporary Music in collaboration with the 17' Rencontres Internationales de Musique Contemporaine de Metz (France), where was performed by the first time in nevember, 1988, played by the Grupo Círculo conducted by José Luis Temes, with Salvador Espasa and Salvador Vidal as flute and clarinet soloists.